THE former boyfriend of missing British expat Lisa Brown has reverted back to his birth name. 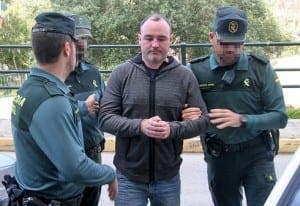 Simon Corner is now using his name, Dean Woods, while he remains in custody in Algeciras prison. As revealed by the Olive Press, the wheeler dealer used many aliases during his years living and working in the Sotogrande area. These included Dean Tripp and Damien Woods. He is the main suspect in the disappearance of Scottish Lisa, who has not been seen since November 2015. Corner was placed in custody in May after fleeing the country and going on the run for six months. Police are also waiting to question Corner’s friend, Stephen Jackson, who was sentenced for people smuggling in the UK last month.